mixedbag December 17, 2015 June 26, 2016 No Comments on Esio Trot – Not just a Dahl-iance! The best part of the holidays apart from the all the festivities and food, is that some really wonderful movies play on TV. I’ve been on a backwards roll lately. I’m going from movies to books as opposed to my usual route of books to movies. First was “Wild” by Cheryl Strayed. I’ve talked about it briefly in my last post. 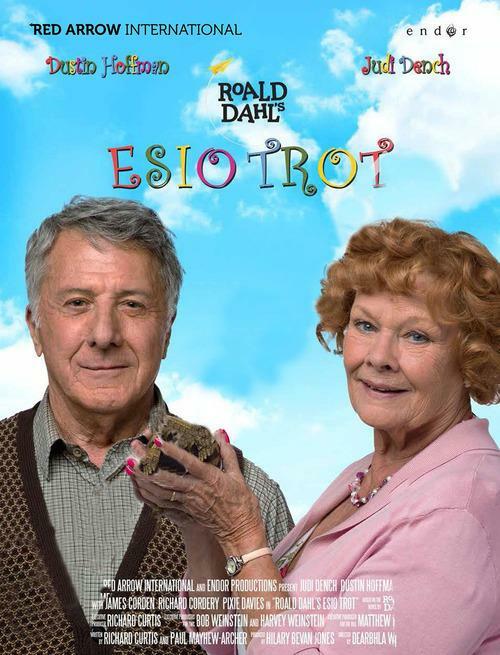 And then yesterday I watched this charming movie ‘Esio Trot’, which is an adaption of Roald Dahl’s book, Esio Trot. I’m no stranger to Roald Dahl’s writing (‘Matilda’ is a gem), but Esio Trot somehow seems to have slipped through the cracks of time. Luckily for me, the Weinstein company has US rights to this movie (at least that’s what the Internet tells me) so I could watch this warm and witty comedy right here at home. Esio Trot is about a bachelor, Mr. Hoppy, played by Dustin Hoffman, who has a crush on the lady who lives downstairs – Mrs. Silver, played by Dame Judi Dench. He spends most of his time in the magnificent garden that he has created in his balcony just so he can catch a few glimpses and exchange pleasantries with Mrs. Silver. He longs to reveal his feelings to her, but Mrs.Silver’s pet tortoise, Alfie is the love of her life. She constantly worries that Alfie isn’t growing as much as she would like it to. Wanting to make her happy, Mr. Hoppy devises a cunning plan. First he makes up a “Bedouin chant” and instructs Mrs. Silver to chant it everyday into Alfie’s ears. The chant’s first line goes “Esio Trot, Esio Trot, Teg Reggib Reggib”, which is backwards for Tortoise Tortoise, Get Bigger. He claims that chanting this everyday will make Alfie grow bigger. He then goes out and buys 100 tortoises of increasing weights and replaces Alfie with a slightly bigger tortoise, with a device he fashions with a fishing rod, a couple of spatulas and utensil scrubbers (it’s genius, really). He weighs each tortoise and replaces the previous day’s tortoise with a slightly bigger one. Mrs. Silver, who in her own words is not “the brightest bulb in the chandelier” is thrilled that the chant is working. Enter the narcissistic, loudmouthed neighbor, Mr. Pringle, who is also smitten by Mrs. Silver. The shy Mr. Hoppy now has to deal with competition to woo and win Mrs. Silver’s heart. I think the casting for this movie is right on target. Dustin Hoffman plays the bashful Mr. Hoppy to the T, complete with his lovelorn eyes and restrained conversation. Dame Judi Dench is the perfect Lavinia Silver. She expertly channels a Lucille Ball-like character with her fluttering eyelashes, low-cut dresses and her flirtatious smiles. In my mind, she’s M, James Bond’s sharp boss, so it was refreshing to see her in such a different and fun role. Richard Cordery plays Mr. Pringle so perfectly that you’ll instantly dislike him. He loves the sound of his own voice, he wears red pants and has a booming laughter. Mrs. Silver calls him an “arse-paralyzing bore”. My favorite part is when Mr Hoppy and Mrs. Silver meet in the elevator for the first time and exchange Facebook statuses – Mrs. Silver’s status is ‘widowed’ to which Mr. Hoppy quips “I’m not on the Facebook”. Made me chuckle. I love me some dry British humor. Despite its predictable happy ending, there’s never a boring moment in the film. Do watch this sweet, heartwarming movie if you get a chance. Like I said, it’s not just a dalliance, it’s a real love story.